Instead of resorting to blankets, coats, and layers upon layers of clothing to keep warm, try increasing the insulation of your home with one simple trick: padding the windows and entryways with bubble wrap. The windows throughout your home are a primary culprit when temperatures drop in the winter, and this is especially true if your windows are a few decades old, or without any type of insulation or special pane. As you turn up the heat inside, your thin windows cause cool air to sneak in and wage a temperature battle. In order to prevent this from happening, bubble wrap adds a layer of protective insulation. According to Build It Solar, bubble wrap is a common, effective insulator during the winter months. Applying bubble wrap to your windows takes just 15 seconds per window, meaning you can have your entire house insulated in mere minutes. All you need is a large supply of bubble wrap, scissors, and a spray bottle filled with water. 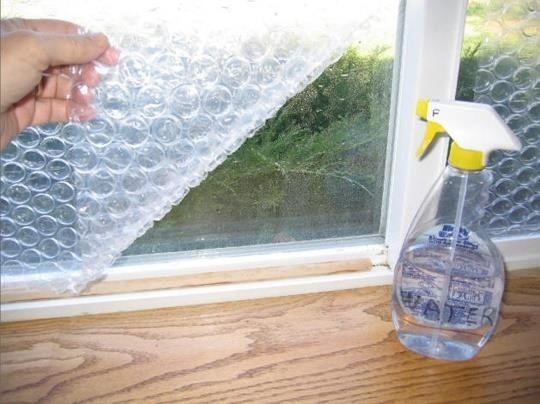 Hold the sheets of bubble wrap up to your windows and cut down to size. You want to make sure the plastic fits easily from edge to edge of the window, resting closely against the pane. Once you've measured and cut, spray water all over your window. Pick up your bubble wrap and press it against the window, with the bubbles themselves touching the glass (the flat back should face you). That's it. After you've pressed the bubble wrap into place, it'll stay there until you choose to remove it. When spring comes and you're finished for the year, simply peel it away, and you'll find clear, unaltered glass beneath. If you find that your windows are particularly tricky and won't allow the bubble wrap to adhere, mix a small amount of glycerin into your water-filled spray bottle. Or, turn to double-stick tape, which will also be strong enough to hold up the light plastic. Your bubble wrapped windows will pay off pretty quickly. Within just two months, you can see a change in your energy bills and usage. Bubble wrap cuts the amount of heat lost through your windows in half, per Build It Solar's calculations—an unwrapped, uninsulated window loses about 168K BTU throughout an average winter season. 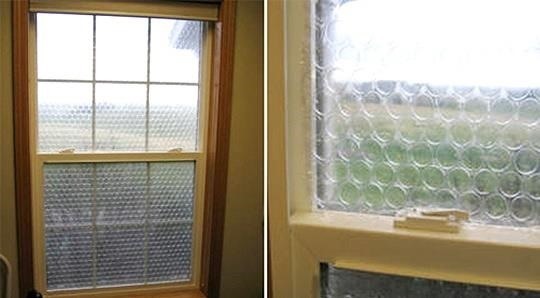 A window insulated with bubble wrap, meanwhile, loses just 88K BTU in the same season. It's the financial gain that makes bubble wrap truly worthwhile. You can save as much as $1.65 per square foot of window on your heating bills over the course of the winter months. The more expensive your heating source—whether natural gas, propane, electricity, etc.—the more you can save with added insulation. Bubble wrap offers financial savings in another way, too: you can continue to use the same bubble wrap, already cut and sized, for multiple years. As long as there are no tears or damage on each piece of plastic, you can reinstall them in the exact same way. Or, use them for shipping purposes when you need it in a pinch. The pros of using bubble wrap are plenty; it's an easy form of insulation to install, doesn't turn your home into a weird spectacle that attracts the neighbors' attention, and reduces your energy use. However, instead of being able to see clearly, the tiny pockets of air will make the outdoors look a little fuzzy. So choose larger-sized bubble wrap, the kind that features medium to large air bubbles. If you install the smaller varieties, your home won't let in as much light, and you won't be able to see much when you peer through the windows. The larger the bubbles themselves, the more sunlight can peek through and the clearer your own view will be. All of these sizes work equally well—it's your own personal preference that determines which is suited for your home. Or, you can skip the bubble wrap altogether and try some window insulation kits out, like Frost King's kit of shrink film which seals out drafts and dust. But bubble wrap is still cheaper in the long run, since a roll will cost less than a bunch of these kits. You don't have to limit your bubble wrap use to your windows—you can expand its efficiency and use it to insulate in many ways. Whether you're preparing for extreme cold, or a slight dip in temperature, you can winterize everything from your car to your home with ordinary products in unexpected ways. does this help with keeping heat out in the summer?